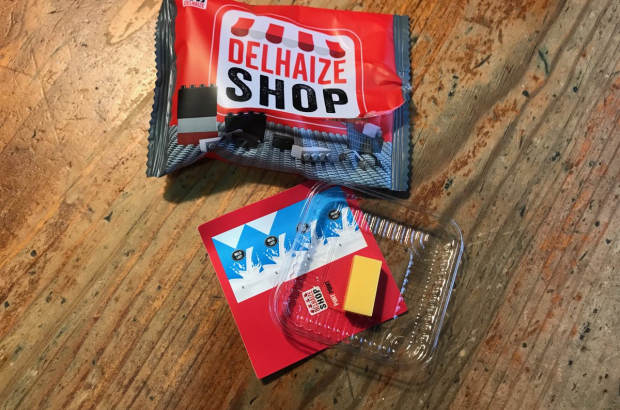 Delhaize came under fire at the weekend for its new giveaways and saving stamp cards, which offer pieces of Lego-like building blocks to kids to build their own Delhaize store. Consumers took the supermarket to task all over social media for the amount of plastic involved in the packaging. Shoppers can earn stamps to fill up a card that allows them to buy pieces of the toy supermarket, such as the Starter Packet, a delivery truck and 50 building blocks. Every shopper, however, gets a free building block with purchase, and these packages are what angered those who took to social media. Other customers noted that the supermarket could not have picked a worse time to launch a campaign for plastic playthings, considering the climate marches of late. The storm of controversy was so intense that the supermarket issued an apology. “We admit that we made an error with this action, and we apologise,” said Delhaize spokesperson Roel Dekelver this morning on Radio 1. Because the plastic packs have already been made, the supermarket sees little reason to cancel the campaign but is placing containers in their supermarkets for shoppers who want to leave the packaging of their plastic bricks behind. This is terrible news. All companies and supermarkets should make a greater effort and change their packaging by using sustainable materials, like different types of cardboard and paper; recycle more. Recycled packaging, and toys for pets and children can all be creatively made, used and played with, and then returned for recycling. Customers could teach supermarkets, business and companies a lesson by NOT buying the products that come with far too much plastic packaging. Don't destroy our planet, instead look after it.